500 Days of Summer — What is love? I figured in the spirit of Valentine’s Day I would pick a romantic comedy and look at how it deals with this confusing notion of love. I picked this film because of it’s tag: “This is not a love story. It’s a story about love.” Enjoy! Starring: Joseph Gordon-Levitt and Zooey Deschanel. This film is about these two people, and deconstructs their relationship. But more importantly it is about this fuzzy notion of love as these two people blindly explore what it is and what it means. One enters the picture believing in destiny and soul mates and the other enters cynically not believing in love at all, only wanting to have fun. Near the end their positions on the subject have switched. However neither extreme is correct. Neither of these ideas is right. There is no such thing as a soul mate in the destiny, only-one-for-me sort of way, but love most definitely exists. At one point Tom is so fed up with love after having his heart broken that he quits his job at a greeting card company blaming the industry, as well as romantic movies, for his unreal expectations. It is a comic scene but there is deep truth to it. Just as Summer pointed out that over half of marriages end in divorce (which is why she doesn’t believe in love), our culture has gotten incredibly confused as to what love is, and because of this miss it. Love is a verb. It is an action, specifically the act of putting someone else’s needs before your own. It is something we all should be doing everyday because we should love everyone. But for some reason we’ve got it into our heads that romantic love is something else, some magic feeling or state, and that once that feeling is gone it is okay to be selfish again. We fear commitment because we fear the magic leaving, instead of recognizing that we have an opportunity to show love most greatly in a committed relationship. The Lord, peerless is He hath made woman and man to abide with each other in the closest companionship, and to be even as a single soul. They are two helpmates, two intimate friends, who should be concerned about the welfare of each of each other. If they live thus, they will pass through this world with perfect contentment, bliss, and peace of heart, and become the object of divine grace and favor in the Kingdom of heaven. But if they do other than this, they will live out their lives in great bitterness, longing at ever moment for death, and will be shamefaced in the Heavenly Realm. This is what a true soul mate is, but it can be anyone, not just one person. I think that many of the reasons relationships falter is that humanity is spiritually seeking God but often does not recognize it. They want eternal, perfect, unconditional love, a love that God can only give, instead of the imperfect, yet beautiful, attempts we humans do. We turn our significant others into idols whom we worship, and that is not healthy. When these people turn out to be mere mortals instead of the gods and goddesses we’ve made them out to be the foundation of the relationship is shaken. This film does a great job of showing just that. It also shows how much pressure is put upon the person who is being idolized to live up to the impossible standards. I am glad this movie was a story about love instead of just a love story because these are conversations we need to be having. The way we think about love, the way we talk about love, and the way we show love is broken. We see it daily through acts of violence, through dissolution of families. But through art, through deep contemplation, we can be inspired to change how we view love, to make it the verb it is. The first sign of faith is love. The message of the holy, divine Manifestations is love; the phenomena of creation are based upon love; the radiance of the world is due to love; the well-being and happiness of the world depend upon it. Therefore, I admonish you that you must strive throughout the human world to diffuse the light of love. 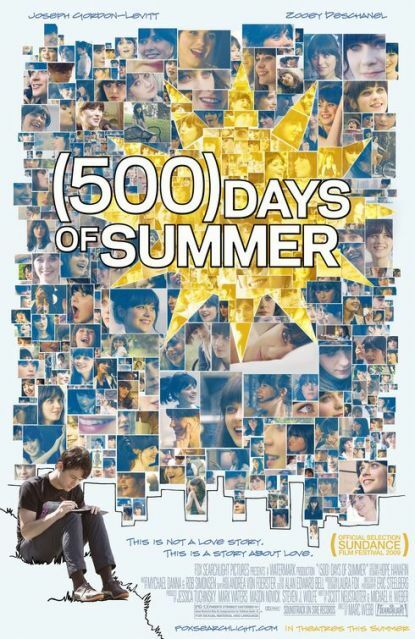 This entry was posted in 500 Days of Summer, Love, Optimism, Romance/Romantic Comedy and tagged 500 Days of Summer, Art, Comedy, Film, heart, Hope, Joseph Gordon-Levitt, Love, marriage, romance, soul, Spirit, story, valentine's day, Zooey Deschanel. Bookmark the permalink. Great breakdown. I really enjoy the layout and way you display quotes. I am so glad you enjoyed the post! I do think that love is confusing and often the romance in films can add to the confusion. That is why I really liked your post as well. Thanks for the positive feedback. Maeve… what a great blog!!!! I agree so much with you about the unconditional love that God gives to us and how disillusioned we become once we start finding imperfections in our fellow humans beings. And I believe that at this point (once u realize the person you love is not perfect) is where a lot of people start to question the relationship and the future of it because its hard to accept that this person that you love is not perfect. This is a very interesting point which you have brought up!!!!!! The other day I was just thinking about soul mates and destiny and our free will in relationships. I believe that a lot of people think that marriage is sent to them and that is their destiny to be with some person. I don’t really share that feeling because of the fact that there are no soul mates and what causes the greatest barriers between us an individuals and the rest of humanity is our own selves/egos. What a great blog!!!! We do need to be talking more about love and experiencing it even more to better understand it. Thanks Nabil! I am so glad you like my blog. Feel free to check out other posts and to pass the link along to whomever you wish. You bring up an important point about egos. Perhaps I will ruminate on that and it will show up in a future post. This is a great post. I’m glad to see that you’re still blogging. I was thinking of doing a post on a similar topic. I have something up right now about how to avoid marrying the wrong person, you might find it interesting. Thanks! Yea, I read it. I love the things you post. I like it when people speak candidly about relationships as opposed to glossing things over. There is a lot of internal and external pressure to find the right person and to marry but less guidance on how one does that.